According to the National Cancer Institute, one out of every six American men develops prostate cancer in his lifetime. In 1995, a study by Dr. Edward Giovannucci and colleagues at Harvard University found that men who consumed tomatoes or tomato products developed fewer cases of prostate cancer. Since then, researchers have sought to identify the component in tomatoes that provides this and other benefits. According to Harvard Medical School, one slice of raw tomato contains approximately 515 micrograms lycopene, while 2 tablespoons of tomato paste contains 13,800 micrograms of lycopene. That means tomato paste contains many times more lycopene than raw tomatoes. Because most research attributes the anticancer properties of tomatoes to lycopene, tomato paste appears to be the better source. 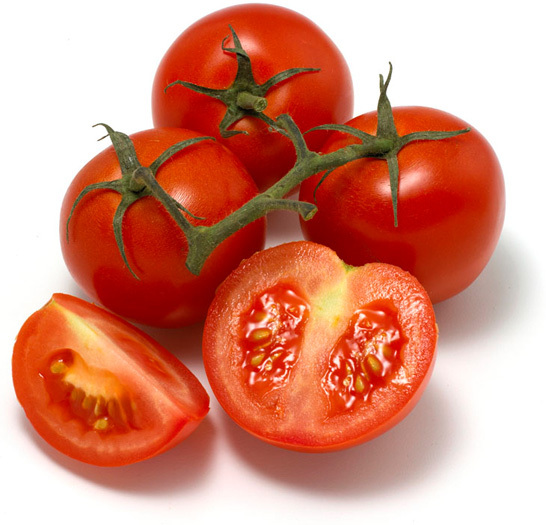 The higher water content of raw tomatoes reduces total lycopene concentration. Raw tomatoes contain approximately 94.5 percent water by weight, according to the USDA Nutrient Database. The processing of tomatoes to form tomato paste causes water loss, so lycopene becomes more concentrated. The structure of lycopene determines how much the body absorbs. Two primary forms of lycopene exist: a straight line -- the all-trans form -- and a chain with kinks -- the cis-isomer form. Processing of tomatoes to form tomato paste increases the amount of cis-lycopene. The smaller structure of the cis-lycopene isomer allows for easier absorption in the small intestine compared to all-trans lycopene. This means that when you eat tomato paste, more of the kinked form of lycopene accumulates in the body compared to its straight counterpart.